When Immigration Detention Means Losing Your Kids After federal immigration agents sent Maria Luis back to Guatemala, her kids went into the Nebraska foster system. It took her five years to get them back. Maria Luis (center) with her children Angie and Daniel on the day they were reunited in 2011. The children spent five years in the foster system after federal immigration officials sent Luis back to her native Guatemala. About five million children in the United States have an undocumented parent. These families have always been at risk of separation if the parents are detained, but expanded immigration enforcement actions under the Trump administration may increase that risk. Immigration attorneys are warning that without preventative measures, more children will end up in foster care, and their parents will struggle to regain custody from outside the United States. They point to cases like that of a Guatemalan woman named Maria Luis, who was separated from her children back in 2005. Federal immigration agents picked up the young mother, who was living in the country illegally in Grand Island, Nebraska. She was detained for about a month, separated from her 7-year-old son and infant daughter. She thought the children would rejoin her on the flight to her native Guatemala, right up until an immigration agent escorted her to her gate. "There was no Angie, no Daniel," she recalls. She says the officer told her, "your children are going to stay with the state. Your children aren't going to Guatemala." Boarding the plane that would take her thousands of miles away from them, Luis says, "I wanted to kill myself. I wanted to die." In the absence of a legally documented guardianship plan, children of detained parents can be handed over to the foster system. To get them back, parents must navigate a complex bureaucracy, often in a second language, while living in an immigration detention facility, or even another country. "For any parent who has been deported and leaves children behind in the United States, it's obviously really difficult to put that family back together," explains Emily Butera, an expert on policies affecting immigrant families at the Women's Refugee Commission. A limited number of children may be detained with their parents. But many are not, either at immigration agents' discretion or because they are U.S. citizens. If undocumented parents have not designated a suitable legal guardian, their children may be placed into foster care. Local child protection systems can enforce a range of requirements to regain custody, from a home study to holding a steady job or even psychological testing. "That's something that's very difficult for a parent to do in the U.S. living in the community, let alone for a parent to do who's in detention, let alone for a parent to do who's been deported," says Butera. Back when Maria Luis' case got national attention, this was a big problem. According to one study in 2011, an estimated 5,000 children whose parents had been deported were in foster care. That included some who had entered custody before their parent's immigration detention. For any parent who has been deported and leaves children behind in the United States, it's obviously really difficult to put that family back together. Under intense criticism that some parental rights had been terminated because of detention or deportations, the Obama administration made a number of policy changes. It implemented new rules to make sure parents' interests were taken into account during immigration proceedings, and it focused deportation efforts on immigrants who committed crimes in the U.S., releasing many detained parents back to their communities. After President Trump took office, he expanded the immigration dragnet to include anyone in the country illegally. Butera says the expansion "is likely to result in more children being placed into child welfare care and, as a result, more parents losing their parental rights." Her organization and others have been urging parents in the United States to prepare documents designating guardianship of their children in case of their own arrest. Immigration and Customs Enforcement told NPR it is "committed to ensuring that the agency's immigration enforcement activities...do not unnecessarily disrupt parental rights." But the Trump administration stands by its overall immigration crackdown, saying it is merely enforcing the law. When Maria Luis was detained in 2005, she hadn't designated a legal guardian for her two children. 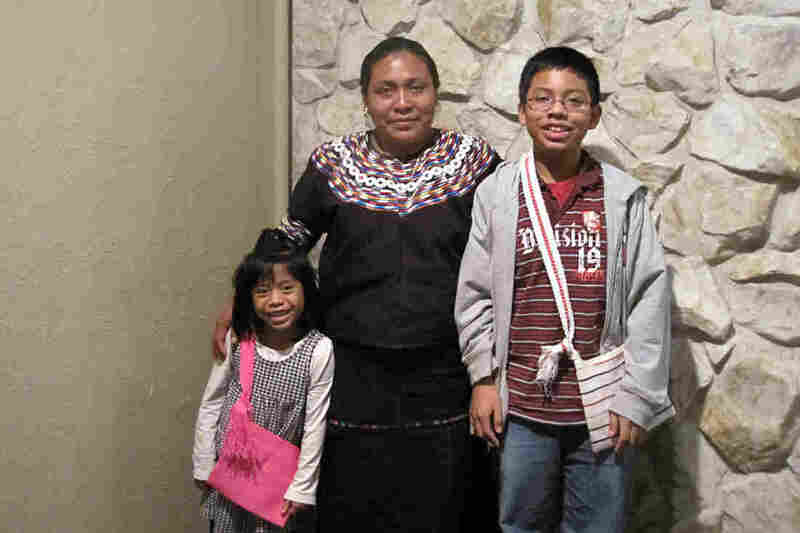 In her quest to get them back, she faced questions about her parenting, and had to prove to the state of Nebraska that she could provide a stable home in her remote, impoverished town in Guatemala. A team of pro bono attorneys fought her case all the way to the Nebraska Supreme Court. She describes the first time she saw her children in five years, when she was allowed to return to the United States for a hearing. "Daniel knew me but Angie didn't. I said to her 'I'm your mother," Luis says. "No, you're not my mother," her daughter replied. "That hurt me a lot," she remembers, "because I had fought and fought and cried for so many years." Luis eventually won her case, overcoming arguments from state foster care officials that her children would have better lives in the U.S.
She says her children have done well in Guatemala in the years since they returned together, but they miss the United States a lot. She does too. Angie lacks documentation that she was born in the U.S. Daniel has proof of citizenship and would like to return, but he doesn't want to leave his mother behind.